Harness the advanced technology of SafEye open path gas detectors for the fast detection of flammable and toxic gases. SafEye "Flash Source" system, used in the 900, 700 and 300 Series, offers well-proven technology for fast detection of combustible gases and vapors over a "Line of Sight" up to 660 ft (200 m) long and are built for reliability and continued operation under extreme environmental conditions. The New SafEye Quasar 900 is an open path detection system which provides continuous monitoring for combustible hydrocarbon gases. It employs “spectral ﬁngerprint” analysis of the atmosphere using the Differential Optical Absorption Spectroscopy (DOAS) technique. 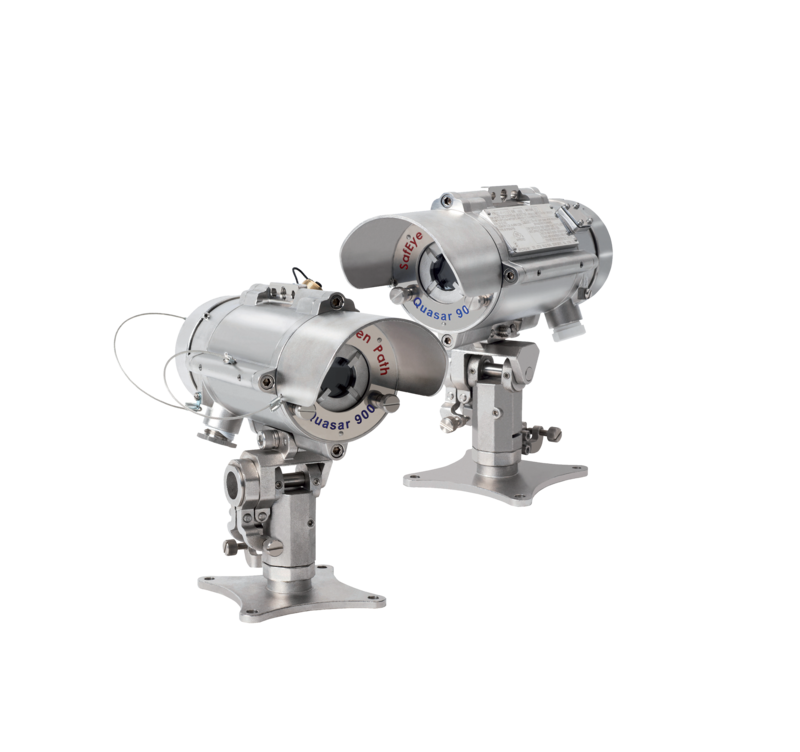 The Quasar 900 consists of a Xenon Flash infrared transmitter and infrared receiver, separated over a line of sight from 23 ft (7m) up to 660 ft (200m) in extremely harsh environments where dust, fog, rain, snow or vibration can cause a high reduction of signal. The Quasar 900 transmitter and receiver are both housed in a rugged, stainless steel, ATEX and IECEx approved enclosure. The main enclosure is EExd ﬂameproof with an integral, segregated, EExe increased safety terminal section. The hand-held communication unit can be connected in-situ via the intrinsically safe approved data port for prognostic and diagnostic maintenance. The Quasar 900 is approved to FM/FMC per Class I Div 1 Group B, C and D and Class I, II Div 1 Group E, F and G, and ATEX/IECEx per Ex d e ib [ib Gb] IIB + H2 T4 Gb, Ex tb IIIC T135°C Db. The Quasar 900 includes heated windows to eliminate condensation and icing, HART capability for digital communication and is designed to meet SIL2 per IEC61508 and FM performance approved per FM6325 and tested per EN60079-29-4.